Jimi Hendrix's Space Brother Saga ! The author, Beckley, says, "I can't say in all honesty that I really knew Jimi Hendrix, but I did see him give a number of really good performances. It was at one of those post- Woodstock concerts where I managed to wind my way backstage. Jimi Hendrix was leaning up against a wall of amps and speakers. As I walked past him, we both just kind of nodded as if we recognized each other, and to this day I can swear I heard him ask me, 'and what planet are you from pal? Jimi expressed a great interest in matters of an extraterrestrial nature, had admitted seeing UFOs, and once told a reporter from The New York Times that he was really from Mars. And he wasn't kidding either. 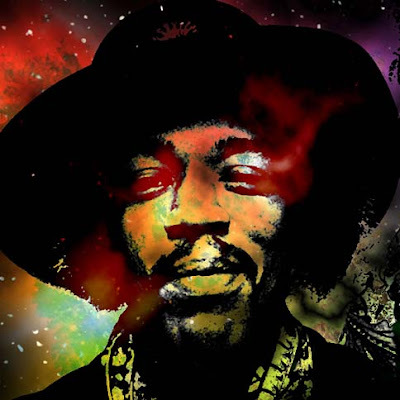 David Henderson, in his book The Life of Jimi Hendrix (Bantam), quotes Jimi's feelings about life on other planets: "There are other people in the solar system, you know, and they have the same feelings too, not necessarily bad feelings, but see, it upsets their way of living for instance - and they are a whole lot heavier than we are. And it's no war games, because they all keep the same place. But like the solar system is going through a change soon and it's going to affect the Earth in about 30 years. On several occasions during his career, UFOs just happened to show up while Jimi was giving a concert. During the last days of his life, he performed on the rim of an extinct volcano in Maui. Jimi played three 45-minute sets, says Henderson in his best-seller. After each set, he retired to a special sacred Hopi Indian tent. Later, witnesses in Maui testified that they heard musical tones emanating from rocks and stones. UFOs were also sighted over the volcano by people who called in to a local radio show. A cameraman on the set said that he fell from his perch after seeing a UFO through his lens. 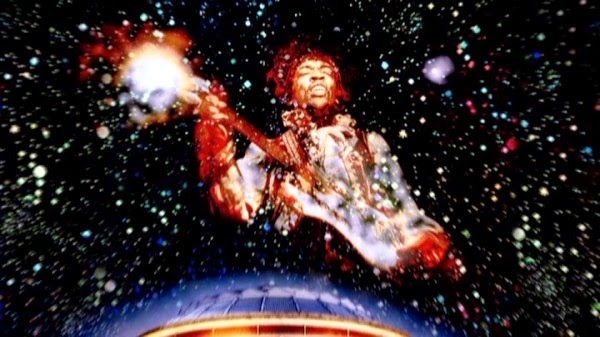 In the film Rainbow Bridge, Hendrix rattles on for several minutes about astral projection and the philosophy of the Space Brothers. He also tried to master the art of psychic healing, through color and sound. Fellow musician and songwriter, Curtis Knight, knew all about the episode involving the UFO in Maui. It was an odd-looking craft that glittered in the bright sunlight. Jimi felt certain the UFO had come down to put its spiritual stamp of approval on the show. He told me that he'd been emotionally and physically recharged by the experience. During the course of our conversation, Curtis also revealed the fascinating details of the time a UFO landed in front of them and actually saved their lives. The event took place on a cold winter's night near Woodstock, NY in 1965. According to Curtis, if it hadn't been for the occupants of this metallic stranger, Jimi and his fellow musicians might have frozen to death. It was four o'clock in the morning, and we were trying to make it back to Manhattan - a drive of more than 100 miles - through the worst blizzard I can recall. The wind was whipping the snow around our van so fiercely that we missed the turn-off leading to the state highway that would put us in the direction of home. The next thing I remember is getting stuck in a drift that reached the hood of our vehicle. Soon it got so cold. The windows were rolled up tight, and we had the heater on full blast to protect us from the rawness of the elements. I had my doubts about seeing the light of day. We could have turned to human icicles very easily. That's how bitter it was! Curtis says the road in front of them suddenly lit up, as a bright phosphorescent object cone-shaped, like a space capsule landed in the snow about 100 feet up ahead. It stood on tripod landing gear, and for all purposes gave the appearance of being something right out of science fiction' At first we thought it was an apparition caused by the cold and our confused state of mind. I mean, we just couldn't believe our eyes. Prodding Jimi with his elbow, Curtis asked if his imagination was playing tricks on him or whether the rock star saw it too. Jimi didn't answer, but sort of smiled. He seemed to be staring out into the night, his eyes riveted on this thing resting within a stone's throw. Curtis was overcome with fright. Before he could make a move of any kind, a door opened on the side of the craft and an entity came forth. He stood eight foot tall, his skin was yellowish, and instead of eyes, the creature had slits. His forehead came to a point, and his head ran straight into his chest, leaving the impression that he had no neck. The being proceeded to float to the ground and glided toward the trapped occupants of the van' It was then that Curtis noticed the snow was melting in the wake of the creature. His body generated tremendous heat, so much so that as it came across a small rise, the snow disappeared around in all directions. In a matter of what seemed like seconds, the being came over to the right- hand side of the van where Jimi was seated and looked right through the window. Jimi seemed to be communicating telepathically with it. Curtis relates that immediately the interior of their vehicle began to heat up. Suddenly, I was roasting! One moment it had been bitter cold, and the next moment we might as well have been in Haiti. The heat coming from the being evaporated the snow enough to free their imprisoned van' As it glided behind our van, I saw the drift had completely vanished. Turning on the ignition key, I gunned the motor and got out of there. As I looked back through the rear view window, I could see the road filling in with snow again' The object - the strange craft - was at the same instant lifting off like a rocket from a launching pad. Jimi never did talk much about what happened. He sort of let me know that the cool thing to do was not to bring up the subject. It was to be our little secret. However, from what he did say, I sort of suspect that the object arrived to save our necks chiefly because Jimi had been practicing trying to communicate by ESP with the beings on board. I know this may be hard to believe, but I'm putting it straight, just like it happened, you hear! The boys from the group who were with us remember nothing. They were out cold in the back. As we got into the main road, they revived. It's as if they had been placed under a spell - you know - hypnotized. A capsule review of Jimi's songs shows that he incorporated some of his interplanetary ties in with his music. The lyrics of many of his songs contain veiled references to UFOs. His album, Axis-Bold as Love, opens with an announcer talking about flying saucers, with a cut following being a catchy tune called, 'Up From the Stars'. Jimini Hendrix was a guitar plAyer. He made a contribution to music.